It turned out to be a day that started and, eventually, ended very well for Kettering Town. Normally, a 2-1 home success to send the Poppies into the third qualifying round of the Emirates FA Cup would be the only headlines. But, as is now widely known, events on the pitch were overtaken by what happened off it ahead of their second qualifying round tie with lower-ranked AFC Mansfield. Kettering have moved a step closer to a return to the town after the club confirmed they have reached an agreement to purchase a piece of land off Scott Road on which they will bid to build a new stadium complex. With the wind firmly in the club’s sails, the players then had their turn to keep the momentum going. And while they didn’t produce a performance that will be as memorable as the news that preceded it, they did what they had to do to ensure a place in Monday’s draw. A Brett Solkhon penalty and a magnificent Ben Milnes free-kick ultimately proved to be enough to wrap this one up, although there was a somewhat unnecessary nervous finish as the Poppies didn’t take their chances before one mistake gave the visitors some hope. The hosts were in control for long spells in the first half but, in the end, only had the one goal to show for it. They really should have gone in front after eight minutes when Milnes’ corner landed on the head of Lathaniel Rowe-Turner right in front of goal but he somehow sent it over instead of into the net. But the breakthrough did arrive midway through the half. Rhys Hoenes was just that bit quicker than Jack Broadhead who brought the flying frontman down after he’d nicked the ball away. A clear penalty and that only meant one thing as Solkhon stepped up to send Jason White the wrong way to maintain his exemplary record from the spot. It could have been more before the break as Gary Stohrer was unable to get a good contact on his final effort after getting into the area and going around White before being forced a bit too wide. And a delicious right-wing cross from Marcus Kelly found no takers as Solkhon and Milnes were unable to get on the end of it. The Poppies did get the breathing space they needed 11 minutes after the restart, however. Hoenes was clipped just outside the box after getting in behind the Mansfield defence. And Milnes stepped up to curl a marvellous free-kick which found its way in with the aid of the post. A goal good enough to win any game. It did turn out to be the winner as well. For all their possession, the Poppies were unable to take advantage of some good openings in front of goal. And a nervous finish was set up when the visitors pulled a goal back with 12 minutes to go. It was a moment to forget for Kettering goalkeeper Paul White as he missed a cross from the right and Brad Wells was on hand to head into an unguarded net. That gave Mansfield plenty of encouragement and they poured forward in search of an equaliser. And their big chance arrived in stoppage-time when the ball broke for substitute Cameron Dear. He got a good connection on his strike but White atoned for his earlier error with an excellent save to ultimately wrap up the game. It wasn’t a vintage display by any stretch but Kettering did more than enough to be worthy winners. Poppies: P White; Berry, Solkhon, Rowe-Turner; Towers (sub Toseland, 75 mins), Richens, Milnes, Meikle, Stohrer; Kelly; Hoenes (sub Borg, 90 mins). Subs not used: Hotter, O’Connor, Rhiney, Davidson-Miller, Elsom. AFC Mansfield: J White; Marsden, Broadhead, Annable, Dudley; D’Laryea, Lindley; Karkach (sub Dear, 51 mins), Ghuachem, B Wells; K Wells (sub Daniels, 55 mins). Subs not used: Guest, Buxton, Pearce-McDonald, Burton, Crosby. Goals: Solkhon pen (22 mins, 1-0), Milnes (56 mins, 2-0), B Wells (78 mins, 2-1). 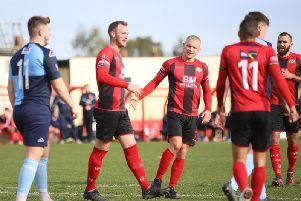 Northants Telegraph man-of-the-match: Ben Milnes - the midfielder was doing his usual job of pulling the strings as usual for the Poppies. But it was his set-piece delivery which really caught the eye. His corners caused problems for the visitors and should have led to more goals for his team. But the coup de grace arrived 11 minutes into the second half when he curled home that magnificent free-kick, which turned out to be the winner. Not the first he’s done that and it won’t be the last either.